Teaching special education means working with students with diverse needs and abilities. Meeting the needs of a diverse group can be challenging and sometimes even overwhelming. 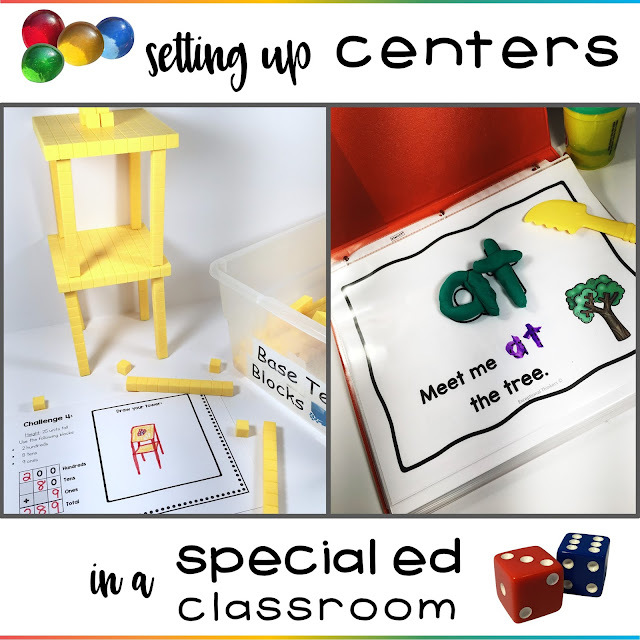 I’ve found that the best way for me to accommodate all of my students’ needs was to use centers in my classroom. As a self-contained teacher with students with severe disabilities, I quickly realized that it was difficult to reach every student during whole group lessons. Even with a smaller class size along with teaching assistants, my students needed activities more specific to their levels and needs. My solution to this problem… Centers. Utilizing centers in the classroom ensures that every student is completing tasks on their level… while freeing me up to do direct instruction with smaller groups or one-on-one. It takes more effort to set up in the beginning, but once you get into the groove, you’ll wish you started them sooner. 1. Reinforce Rules, Routines, and Procedures. Before implementing your centers, plan out how you want it to run. Will students be able to choose their own activities or will you have them laid out? How long will they be in their centers? What should students do if they need help with an activity? Set up some basic rules for your centers and go over them before you begin. Have students practice moving to their centers and getting their materials. Have them act out different scenarios, such as having a question, needing to use the bathroom, or a classmate not following directions. My piece of advice: Don’t just dive right into using centers. Practice them together first. Start with one or two centers while the rest of the class reads silently. Guide the students through each step. Then try three. Practice the routines until you feel the class is able to go into their centers and complete their activities independently. Then, you’ll be able to take a group to the side for direct instruction while the rest of the class goes to their center activities. 2. Prep It and Forget It. My favorite kinds of centers are the kind I can prep and keep on hand for later use. 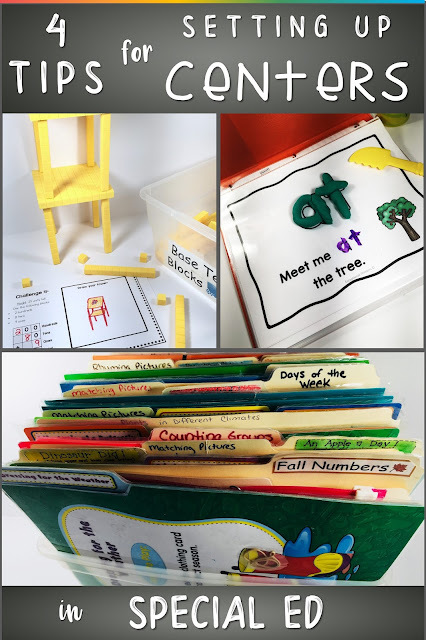 If you’ve been following me on TPT, Facebook, Instagram, or Pinterest, you might notice a trend… I love file folder activities! Why? Because even if you have a ton of them, they take up practically no space, the kids love them, but best of all, once they’re prepped, you have them forever! I have file folder games from over 10 years ago that are still going strong. If I need a quick activity and don’t have time to prep, file folder games to the rescue! If you're looking for some math file folder games, you're in luck! I have several to choose from in TPT shop or you can buy the bundle and get them all at a discounted price! But there are many other types of centers too. You can make them as simple or elaborate as you like. You can throw a book in a Ziploc bag along with a story map sheet and a mini flashlight and invite students to read their book in a pop up tent in the back of the room. Or you can just put some blocks in a basket and let them complete a math worksheet with some manipulatives. Think about what would work best for your class and curriculum. Make a list of ideas and the materials needed for each one. 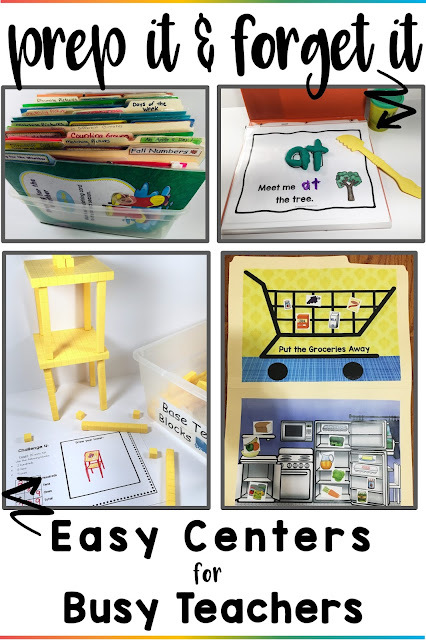 Extra bonus if you can store away your center activity in a file folder, Ziploc bag, or shoe box container for later use! I know that once your centers are set up and going smoothly, they’ll generally run themselves with little adult intervention. But when I say “Prep it and forget it,” I don’t mean forget it completely. You’ll need to check them periodically to make sure there are no pieces missing or broken. You also want to reflect on student progress and decide if your center activities are challenging (but not too challenging) for them. You may wish to provide more than one activity at each center to encourage autonomy and increase student motivation. Or maybe you want to provide the same activity but differentiated for diverse learners at different levels. Totally up to you but plan it out ahead of time. Think about how you want to keep track of who is completing what activities. You can download my Center Rotation Chart for FREE! 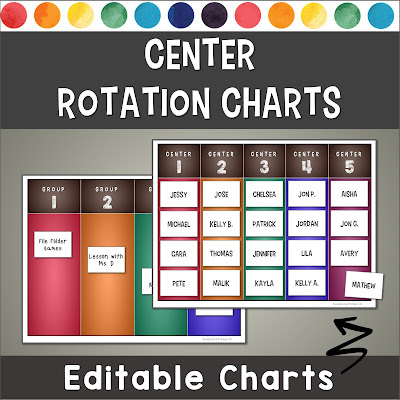 If you need an editable version to add student names or activity titles, check out my Editable Center Rotation Charts. Students will know at a glance where they are heading and what they will be doing. It just makes life so much easier. You can keep track of which tasks each student has completed this way and then switch it up each day or week. If you truly want your centers to run themselves, you’ll need to make them fool-proof. 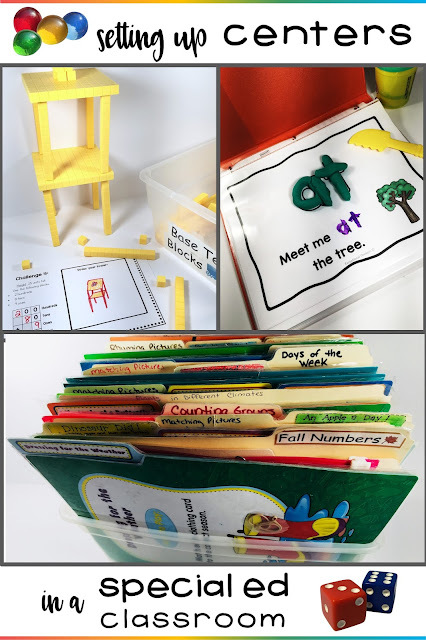 All materials need to be either laid out ahead of time or stored within student reach. 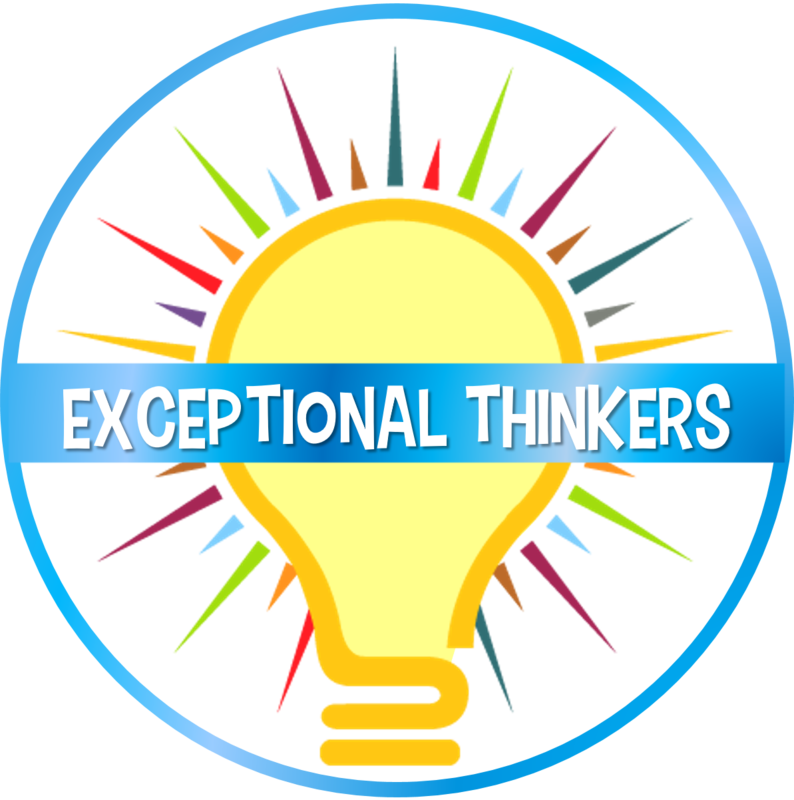 And this may seem obvious, but make sure that all center activities are within your students’ ability level. If there are multiple steps to the activity, make sure directions are laid out with the materials (Use picture cues for non-readers). Before splitting into groups, explain each activity so students know what they are expected to do once they’re on their own. You don’t want students wandering around, unsure of where they should be or what they’re doing. Once the centers are well established in your classroom, you’ll be able to sit back and watch your students buzz around as they get to work. You’ll be able to pull out a few students for direct instruction while the rest of the class enjoys their center tasks. Your instruction will be better suited for individual needs and students will gain better a sense of independence and responsibility. Your centers won’t become perfect overnight, but it really shouldn’t take long (two weeks maybe?). Once you get to that point of student independence, it will be a sigh of relief and freedom. I ran centers for almost every subject. If you walked into my classroom, it would be highly unusual to see the entire class doing exactly the same thing. When you have a student reading on a fifth grade level sitting next to a child still learning the letters, whole group instruction just doesn’t make sense. If you use centers in your class, I would love to see how you implement them! 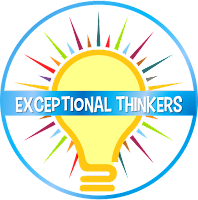 Tag Exceptional Thinkers in any photos of your room setup or in- action shots on Facebook or Instagram.